Do Students know where to find the Gradebook? If some of your students report being unable to see their grades while others report otherwise, students may be unaware of the location of the gradebook in Moodle. Try to take time to explain how you setup the gradebook, where to find it in Moodle, and what they can find there. Direct them to this page for more help. Is the Gradebook Visible to Students? If students are reporting that they cannot see the Moodle grade book at all, then this indicates that your course settings are set up such that grades are not set to be available to students. On your course page, look for the Course Administration block. Expand Appearance and make sure Show gradebook to students toggle is set to Yes. Is a Graded Activity Hidden? If students report that they are able to see most of their grades except for one particular graded activity, check to see if the activity is hidden from students. Hiding a graded activity also hides the corresponding item in the gradebook. On your course page, click Turn editing on. 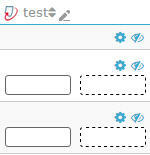 Editing icons appear next to each editable item on the page. Locate the graded activity in your Moodle course. Next to the activity, notice the editing icons under edit. If the text of the activity is grey and under edit, you see Show, the activity is currently hidden from students. If the activity is hidden, Click Show once. The icon will change to Hide and the text will return to black. The grades for the activity will also be visible in the gradebook for students. Are Grade Items Set to Be Visible? Instructors can control the visibility of individual grade items through the Categories and Items page of the gradebook. You can also show or hide category total and the course total. On your course page, open the gradebook by clicking on Grades. At the dropdown menu, click Gradebook Setup. Next to each grade item (column), note the action icons. If the text of the grade item is grey and the show/hide icon (eye) has a line through it, the grade item is currently hidden from students. 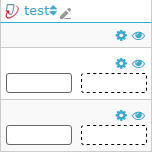 To make a hidden grade item visible to students, click the show/hide icon once. The icon will change to an open eye. Are Category Totals or the Course Total Visible? At the dropdown menu, click Course Grade Settings and scroll down to the User report. Select Show totals including hidden items to show the total grade with hidden grades included in the calculation. Select Show totals excluding hidden items to show the total grade with hidden grades left out of the calculation.